As usual, I did a little research for this talk today, very little, and started with investigating what sounds a swan makes so I could comment on them here. Guess what. Swans are mute. Irony is great. Undeterred, I pressed on since I believe I have something worthwhile to say to this community, and besides, I like y’all. My tendency, wherever I land is to try to make something a bit better. Due to my previous experiences at UU churches I think I see a way to offer ideas for this church to get where it seems to want to go. So, muteness aside, this talk is about what I want to leave you with as Sharon and I head out on a new adventure, or adventures, beginning this winter. As of April or May we will be away to places as yet unknown, doing who knows what, and will likely be checking in irregularly with this group from then on. So, we will be around a few more months, available to discuss whatever, certainly available to talk about any points you feel need talking about after today. On 2 or more previous occasions, once from this pulpit, I have talked with you about some of my experiences at the UU church in Augusta, GA. My previous 2-or-more efforts at raising awareness and making a point were, I think, ineffective, mainly because I was a bit too indirect. Today I want to be more direct. First some relevant history. My involvement with the Augusta, GA Unitarian church was in the 80’s and 90’s when I was active on the UUCA board, on various committees like ministerial selection, then a much different committee later on. This later committee role came about when the church was experiencing serious uproar over an issue, or apparent issue. The specifics are not pertinent, but the fact that people in the congregation were at “quitting the church” emotional levels is indicative of the level of seriousness of the uproar. What did the board (that church’s version of our management committee) do? The church certainly could not afford to lose members. At the time, the early 90’s, the church had been waddling along for years with 60 to 80 pledging members, trying many tactics to grow in order to afford the new sanctuary it had just built on the mantra “if you build it they will come”. “They” didn’t. In their efforts to increase the size of the congregation the Augusta church had lost track of a basic principle, the definition of church. People don’t come to a church, the second visit anyway, for the building. They come for the community. A church is not a building, it’s the people. The people at the UU church in Augusta, GA had been having a hard time well before the uproar, and tried mightily to paper it over by making the building prettier. That tactic didn’t work, but it left the flaws within the community intact, still rocking along at 60 to 80 members. What did that board do in response to this uproar, this existential challenge to the congregation? It installed what it called a mediation panel to help dig the group out of the emotional hole it had dug. I was on that panel, the later role I spoke of, with 4 other intrepid souls, all confirmed conflict avoiders, save one. 4 conflict avoiders and one professional councillor. What a crew. I’ll get into what we did, and the outcomes, later. First, I want to do a bit of audience participation, mainly as an illustration of what we have here at AUC. A church is the community of people, right? It runs, by definition, largely on voluntary help. So, let’s see what sort of community we have here. I will run through a few essential activities of the church and if you are now, or ever have been, involved in any of these, please stand if you are able. * Management committee – runs the day to day operations of the church; building committee – keeping the building standing and legal, church services auction – essential fund raiser each year; peace and social justice group – title is its own definition; lunch bunch – social group; worship support committee – provides coverage when the pastor is away; finance committee – makes sure we have enough money in the bank; provide flowers, stand as greeter, organise and provide morning tea after a service; produced a church directory; operate the technical aspects of a Sunday service and get it published on the internet; there are plenty of items I have missed. Look around. This is the definition of a voluntary organisation, this is the backbone of a church. Thank you. Have a seat. Does everyone participate to the same level? No. Does that mean that some folks are more important than others because of their unequal levels of participation? It can, but I honestly don’t think that plays much of a role in the power structure of this church. WHAT! Power structure! What power structure? Come on guys, this is a human endeavour, and humans are social animals who organize themselves into societies with hierarchies. Voluntary organizations often have firmer hierarchies than commercial ones. The voluntary ones only get into trouble when the informal communication systems become rigidly set or fraught with secrets. Sort of like dysfunctional families. That’s what had happened under the radar at the UU church in Augusta, GA. The community had solidified into cliques, each with secrets, undeclared conflicts abounded. Issues had been swept under the rug for 20+ years; the friendly Sunday morning interactions among these lovely folks had edges to them; no one enjoys conflicts so no one belled this cat. And the atmosphere of the church, which had wondrous bon homme’ was mostly for show. Know who didn’t believe it? Visitors. Luckily, for the UUCA, there was a blast that disallowed any delay in addressing conflicts. I say luckily because without the uproar I suspect the congregation would never have addressed the core issues it had. What did the 5 people on the mediation panel do? Not much, really, just met with one another almost weekly over 5 years; we learned how to communicate with one another honestly and lovingly; we, with the help of a professional, organized communication workshops for the church and ourselves; we taught ourselves how to creatively interact when issues arose; we attended church committee meetings, usually in pairs, to act as mediators making sure all at the meeting were heard; we made ourselves available if someone in the congregation needed to bring up an issue and then we offered to go with that person as support so he or she could address the issue directly with the other party involved. We reduced the tendency to triangulate issues/conflicts when they arose (they always do you know, conflicts are normal – how we deal with them is key). People began speaking directly to the other party involved, and doing it early, when the issue was small. How long did it take for these changes to be fully affected? About 5 years. By the time the mediation panel was disbanded Sharon and I had moved to a different town, 4.5 hrs. drive from Augusta. What were some outcomes? After 5 years, maybe 6, the pledging membership in the church was up to 140, the sanctuary that had been built no longer held everyone who wanted to attend so they had to go to 2 services per Sunday, the atmosphere when entering the church on a Sunday was electric and attractive. And we didn’t do much more than treat one another directly but kindly, with active listening, and real problem solving through heartfelt conversation. You know, church stuff. Auckland Unitarian Church has a marvellous congregation that has, over the last 100 years or so, solidified a bit. I suggest a small inoculation of real conversation aided by active listening as a first step to loosening the bonds of solidification. 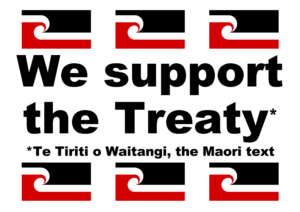 We certainly have the committed folks to get it done, just not the uproar that might push it along. I wonder if it can be accomplished without uproar? I suspect so, given the people available to make it happen. Clichés abound to describe the process of change, of renewal, such as omelettes and eggs, journeys of many miles and first steps, etc. etc. Our advantage is that we have 7 principles to guide us along in our omelette making, on our journey. Amen. 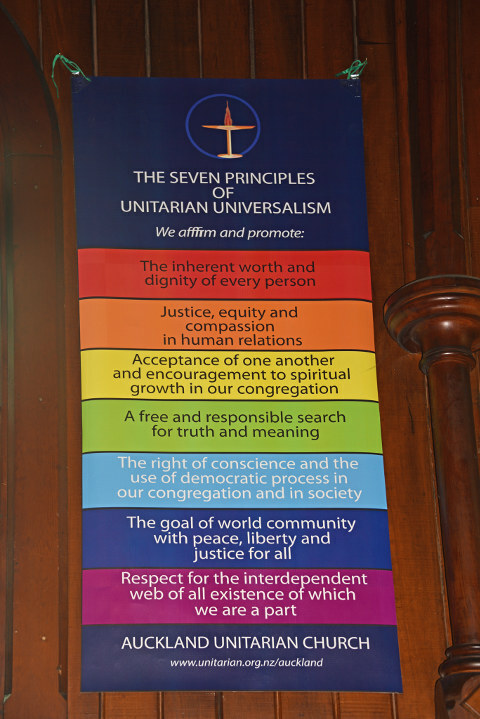 The 7 Principles of Unitarian Universalism.